Seven months ago Sport England launched “This Girl Can”. Uplifting slogans, a catchy soundtrack, and real images of real women doing sport were supposed to encourage the female population to get active. The campaign was designed to change attitudes towards taking part in sport and, in doing so, to address the participation gap in physical activity – two million fewer women regularly take part in sport than men. Research shows that a major factor behind the participation gap is a fear of judgement. Some women don’t take part in sport because they’re afraid of being judged when they do so: judged for being the wrong size or shape, for not knowing what to do, for doing it “wrong”, or for looking sweaty or unattractive while exercising. The campaign is intended to dispel that fear, to create a sense of community, and to suggest that all women can, and should, get active. Seven months after Missy Elliott encouraged women everywhere to “get their freak on”, it is becoming clear that for the campaign to make a real difference, in a lasting way, will require widespread grassroots support. Should Mo Farah distance himself from Alberto Salazar? Innocent until proven guilty. This idea underpins justice systems around the world. And yet in the case of Farah’s coach Salazar it seems to be guilty until proven innocent. Salazar has not been convicted of doping, Farah has not been found guilty of drugs offences. And yet huge media pressure has been heaped on the British gold medal winner to distance himself from his coach and his coaching set up. This is unfair. Farah has achieved great things under Salazar, training at the Nike Oregon Project in America. His results suggest Farah is a highly committed and talented athlete, and that Salazar is an excellent coach. Gold medals and world records demonstrate that this partnership works. And if it is a partnership which works, then to ask Farah to distance himself from the man who has created his success, is a big ask. The allegations levelled against Alberto Salazar relate to a time before he coached Mo, and they relate to other athletes. Farah himself has not been accused of anything, and there is no suggestion or evidence linking him to anything suspicious. And Mo is aiming for even greater glory. He has plans to run at Rio, and he will plan to do so using the highly effective coaching methods of Salazar. To pressure Farah into breaking away from Salazar at this point, is to suggest that innocent until proven guilty means nothing. Athletics is a sport marred by doping scandals. The public is losing faith that WADA can police this successfully: short bans (Tyson Gay) and successful comebacks (Justin Gatlin) adding to the loss of the sport’s integrity. Ambassadors for the sport, of whom Mo Farah has certainly been one, work tirelessly to promote the clean side of the sport, to make people believe that cheating is not endemic to their sport. The allegations against Salazar are just that: allegations, and the success of the Farah-Salazar partnership is evident. But the fact is this: past evidence suggests that all too often allegations prove to be true. That is not to say that Salazar is guilty of that of which he is accused, but there is a chance he is. 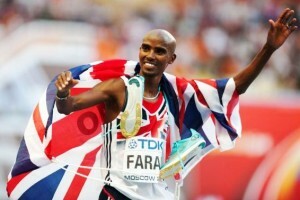 Farah already believes that his name has been ‘dragged through mud’, and as a clean athlete he has a right to be angry. But if it emerges, somewhere down the line, that Salazar is guilty, and Farah has remained associated with him once aware of the allegations, Farah will have no right to complain. And, rightly or wrongly, a shadow of doubt will be cast across his entire career and achievements – was he really clean? An athlete of Farah’s calibre cannot take this risk, for his own sake, but also for the sake of the sport to which he has given so much.